My name is John Kaiser, Jr. I own and operate Yacht View Brokerage LLC, a full service Power and Sail Brokerage, here in Annapolis, Maryland. I began my business 30 years ago to better serve my clients buying and selling needs of their power or sailing yachts from 25-80'. I offer a more focused and personal approach to buying or selling yachts since I work with only a few buyers or seller at any given time. Currently I hold a 100 ton USCG Merchant Marine Officer Auxiliary Sail/Motor/Master's license (since 1983) and am fully commercially insured. 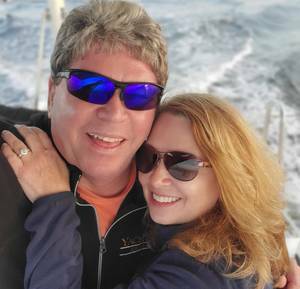 I have built custom yachts with my Father at Kaiser Yachts in Wilmington, Delaware, graduated from Regis University in Denver, Colorado, owned a charter sailing, diving and fishing business for many years in Duck Key, Florida Keys and Edgartown, Martha's Vineyard, Mass. and have delivered many types and sizes of sailing and power yachts to destinations all over the east coast of the US. I attended the Photographic Workshops in Rockport Maine to learn the Film/Video production and Photography business and to become a proficient cameraman. I also love delivering yachts and know every turn of the ICW from Key West to Norfolk, including the entire Chesapeake Bay to Maine! I began my brokerage business here in Annapolis in 1988 and strive to use every tool to enhance the marketing and sales time of every one of my personal listings. I apply myself to the strictest standards of excellence and work for my clients satisfaction. I can also arrange for a USCG licensed Captain delivery of your yacht to Annapolis to be sold, or for your new purchase delivered to your destination after the sale! My reputation is built daily on my clients satisfaction and pride of their yacht ownership. (call or email to have me put you in touch with my most recent buyers or sellers) This is the reason that I retain most all of my past customers to help them sell their boats when they are ready to move up or down in size or retire from boating. When you list your yacht, I will advertise her in national and local publications such as Chesapeake Bay Magazine, Prop Talk and Spin Sheet and on my www.Yachtworld.com & www.Boats.com and www.theyachtmarket.com web sites, with over 150 professionally taken, beautiful, high resolution, digital wide-angle color photographs, detailed layout drawings and a complete inventory list of exactly what is included in the sale. I will become your private broker during the selling period, since all of my attention is paid to the effort of selling your yacht! I will list and market your yacht from her current location or will offer complimentary dockage at my Annapolis area location. We also will arrange to have your Yacht cleaned, detailed and serviced, so she is in top showing/selling condition. No other broker I know of offers such attention to selling "only" your yacht! I represent both power and sailboats and specialize in high quality Downeast style Cruisers, Trawlers, Motoryachts, Pilothouse Trawlers, Tugs and offshore boats, as well as Grand Banks, Krogen, Nordic, Defever, Eastbay, Marlow, Aleutian, Ocean Alexander, Albin, Duffy, Wilbur, Newman, Hinckley, Selene, Nordhavn, American Tug, Hood Whisperjet, Sabreline, Cape Dory, Back Cove, Dyer and Fortier. I also specialize in quality offshore-type sailboats of traditional design such as Kaiser Gale Force yachts (my Father's designs!) Shannon, Bristol, Pacific Seacraft, Hans Christian, Tartan, Passport, Valiant, Cape Dory, Hinckley, Hallberg Rassy, Sabre, Swan, Little Harbor, Lyman Morse, Alden and Oyster. Call or E-mail Captain John Kaiser, Jr. (john@yachtview.com) for details and to list your yacht today! I am busy selling my current inventory and always need new listings to market and sell. I am YOUR personal agent and work to ONLY sell your listing. I accept all high quality Power or Sailing Yacht listings from 25'-80' which are well maintained and priced to current market. Let me give you the full attention you and your yacht deserves immediately! I list and sell my offerings in usually under 90 days if they are market priced! If you are ready to proceed, please give me a call or email now! Contact John Kaiser Jr. @ john@yachtview.com or his Cell anytime @ 443-223-7864. Thank you for considering my professional Brokerage service. I work equally helping you either sell or purchase your yacht. If you would like to be pre-qualified for marine financing, please contact each of the following Marine finance representatives for a competitive quote. All lenders are locally based in the Annapolis area and offer slightly different programs and rates based on your specific needs and credit history. Remember, many boats qualify as second home mortgage deductions and many times you may incorporate your state's "Use Tax" into the loan! Feel free to interview these local Marine Surveyors I have worked with for many years: Peter Hartoft www.hartoftmarinesurvey.com @ 410-263-3609/$20-$24.00/ft., Jim McGlincy of Bay Shore Marine Surveys @ 410-808-3849/$20.00/ft. Also contact www.marinesurvey.org for a complete list of SAMS or www.namsglobal.org for NAMS surveyors nationwide. Local Mobile Interior and Cushion Cleaning: Annapolis ChemDry, "Josh" @ 410-255-8200. Local Marine Service on Systems, electronic and general repair: Steve Catz @ 410-231-3191 or his web site @ www.stevesmarineservice.com or Patrick at Marine Electric Systems @ 443-790-5783 or Info@marineelectricsystems.net Local Marina: Smiths Marina, www.smithsmarina.com Crownsville, MD. 35T travel lift, excellent service including fiberglass repair, bottom service and land/water storage. Contact Rick or Valerie Smith, 410-923-3444. *Yacht View Brokerage LLC is always interested in very well maintained yachts to list, market & sell, call John Kaiser on his cell @ 443-223-7864 anytime! Listed on 3/23/2019, "Red Turtle", Our Nordic Tug 32 is now available for your inspection on land at Tidewater Marina in Havre De Grace! Her owner has prepped her and serviced her for spring launch approx. May 1st. Updated photos on line as of today, 4/5/2019. Saying "Good-bye" to the Red Turtle is not easy. She has been our summer home for the past 5 years and we routinely spent between 43 to 58 Days on the water during the Boating Season. Purchased in Florida, we embarked on a 1,200 nm trip, bringing her to our slip at the top of the Chesapeake Bay. Previously, we were sailors that were contained to the bay, so traveling the ICW was a real adventure. It didn't take long for us to become, impressed with the comfort level of the Red Turtle. First, the pilot house has great visibility. It is quite easy for two to navigate between the Chartplotter and what we can see out of the multiple windows. At the end of the day, we often anchored, and realized that one could get comfortable on a boat!!! The top deck with bimini, the aft deck with water proof cover, a salon with comfortable cushions and the bow sleeping quarters where being rocked to sleep is wonderful. Many 3 Star meals were served at anchor thanks to Penny while Joe was relentless in checking mechanical equipment so there would not be any surprises the next day. 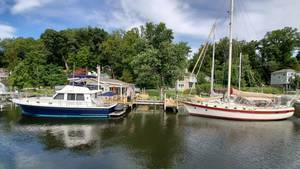 We traveled the bay from Chesapeake City Md to Cape Charles, Va while visiting all the major rivers.....and discovering coves to anchor in. The Red Turtle knows the best spots to view sun sets, and the safe coves for those crazy thunder storms. A great adventure was traveling North up the Hudson River to the locks at Troy, NY. Imagine the thrill of being on your own boat while you pass the Statue of Liberty!! It seems to be the right time to add these times to our memories. We have had a wonderful time on the water...now, it is the time to discover adventures on land. There are two V-Berths.....Port Berth is about 6’2” long or so (I sleep in this one and am 6’2”). Starboard Berth is about 7’ long. Both Berths have large Storage Areas underneath them. VacuFlush Toilet System. overhauled in 2018.
back it becomes a large Sofa. All in All 4 people could sleep in Red Turtle but it is perfect for two. Stove is Electric and does not have an Oven. Boat Lights are 90% LED. Other instruments.....Clocks, Outside and Inside Thermometers, Depth Finder, Radar, Autohelm, XM Antenna, GPS Antenna, Lightning Protection Antenna, and VHF Radio & Antenna.